Can we just get the straight facts please about MH370? For the past week or so, CNN has been blabbering about the presumed fact that the pilots of the vanished flight, MH370, programmed a new route into the flight computer at some time between 1:07 and 1:19 AM. This was, even according to one of their own experts, blatant nonsense. Wherever this information came from, it did not jive with the known facts. Namely that the ACARS system in board would not transmit a yet-to-be-executed flight plan to the ground even if they subscribed to the transmission of navigational data (which they didn’t.) And that the ACARS system on board was not scheduled to make another transmission until 1:37 AM, at which time it was no longer functional. It became kind of obvious from sporadic comments that this “fact” was nothing but speculation, based on the presumed smooth turn the aircraft executed shortly after the last voice transmission; someone must have concluded that such a smooth turn was done by the flight computer, and thus it had to be entered into the flight computer, presumably after the last (1:07 AM) ACARS transmission. None of this made any sense to me, and today, CNN confirmed my suspicions: Malaysian authorities assert that no air-to-ground transmission indicated a route change. 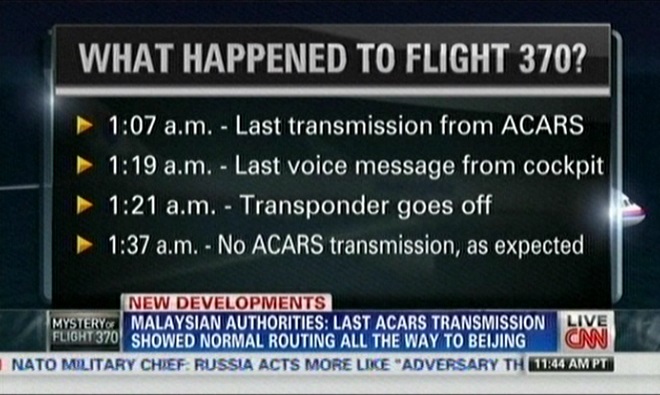 But… exactly where did they get the idea from that the last transmission showed normal routing all the way to Beijing? According to their own words, what Malaysian authorities said was that the last transmission did not show a preprogrammed turn. From this, you cannot conclude anything as to what it did show, especially given the fact, reported earlier, that the airline’s ACARS subscription did not cover navigational data in the first place. Exactly what would it take for CNN to present the facts correctly, just once, without adding their own bits of creative fiction? Update (2014/03/23): It appears that CNN is blameless at this point. The piece of creative fiction (if that’s what it is) apparently comes directly from Malaysia’s transportation ministry. That does not make it more believable, though, in my opinion.